What kid doesn’t love making a fort with blankets and chairs? And what parent doesn’t cringe a little when the kids grab your best clean sheets to make their fortress? With the Fortamajig, kids can exercise their architectural creativity and keep your special linens out of the game. The inventor is Katherine Huck, a mom of three who wanted to create a safe, portable way for kids to build their own play spaces. She designed an 8’ x 8’ square of polyester fabric with a built-in door and window. Velcro loops make it easy to attach the Fortamajig to whatever structure is handy — a chair, table leg, doorknob, tree branch, fencepost, you name it. So you won’t be dealing with duct tape attached to the upholstery either. Kids can use their imagination to build a tent, tunnel, or fort in any spot, indoors or outside. You can tie it to a pair of beach chairs for instant shade at the beach, or extend it from a curtain rod to make a canopy. It’s machine washable, which makes cleanup a cinch if playtime gets messy. So round up the cavalry and start building! 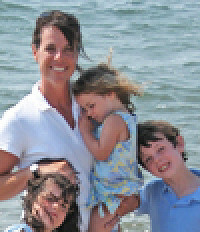 As the mom of 3 of them, I was inspired to create the Original Fortamajig and am delighted to be featured on the Daily Grommet. Based on the classic play theme of building blanket forts, the Fortamajig allows kids the ease and flexibility of creating any fort, anywhere, indoors or outside. With built-in loops, a window and door, kids can go from building a teepee, tunnel, 4 walled fort, canopy - really just about anything - all with one toy. The Fortamajig will grow with a child's imagination and be different and imaginative everyday and anywhere. I am thrilled to share it with you and look forward to connecting with you today! Great product for the kids. Is the product water repellent and if so, about how many washings does it last? Also, how much does one 8'x8' weigh? Was thinking it might work well for camping and hiking too. Great questions! Thanks so much for chiming in. This product is water resistant, but we do not treat the fabric to repel. That being said, with our product testing, water does not seep through the fabric easily. Since this product is designed out of durable polyester, simulated to resemble nylon, washing will not wear on the fabric. We recommend making sure the velcro is reattached to itself when washing. Lastly - the single layer Fortamajig weighs roughly 1lb. 1oz. 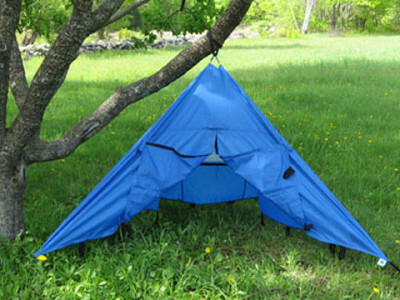 Its so lightweight and easy to take along anywhere - terrific for both camping and hiking! Forts are being constructed all the time in our backyard and this looks so much better than using the blankets the kids steal from the house. Pulling a blanket taut so that it can be a roof without slumping into the fort is nearly impossible. It looks like you were very thoughtful with the placement of all the loops, too, so that it is amazingly versatile. Fun, fun product! We love the fortamajig, we own several. The kids connect them together to make big forts and forts inside forts. We have taken them camping where we hid under them in a rainstorm. We have used them off a tree in the yard to guard against the sun and in a park we used them off a fence to make a sun shield for a sleeping baby in a stroller. They have an endless number of uses but most importantly are a lot of fun! Is there a way to use it at the beach without it blowing away? :) Looks like a fantastic product! Yes! The Fortamajig is designed with 4 corner pockets that you can fill with sand at the beach to anchor any kind of fort you create off of something stable like beach chairs or coolers. Its a fun way to provide some instant shade! Thanks so much for the question. oh my god - why didn't I have this as a kid!? Great idea. Oh, Perfect! This would be great for our vacation. Thanks! My daughter is going through a pink phase. She'll only play with toys that are pink, wear clothes that are pink, eat foods that are pink (that's been fun). Does the fortamajig come in pink? Wow this looks great. My kids would love this outside, but I'm worried about the loops fitting over our outdoor furniture - How do they work - are they adjustable? HI! I LOVE this idea! My son is about 20 months now and currently, this is true, he loves playing in a large cardboard box. He likes climbing in and out of it, and feeling in control of his play space. I think the Fortamajig will go along with his type of "play" perfectly! Hi Ellen - Yes, the loops around the exterior perimeter of the Fortamajig are stretchy and adjustable using velcro - so there are no hard buttons, snaps or clips to fiddle with. Its easy to quickly wrap the loops around large pieces of furniture or a fence post. In addition, the Fortamajig comes with a pack of extra extension loops simply designed to help further your reach and ability to get around a large tree trunk or the couch leg that is 3 feet away. Hope this helps. Thanks for asking! @Kim - it is so funny when a child shows a strong preference for a particular color! The Fortamajig style that we are featuring only comes in the three colors. Genius!! I have fond memories of building forts with my brother and sister while growing up! So thankful that my parents didn't mind! This would have DEFINITELY come in handy! I'll have to see if I can convince my Husband to let us buy one as a gift for a family member! Are the three pictures of forts all using the same piece, just different colours? Sorry, I need bigger pictures. We have the Cranium Superfort and while I love it, it is bulky and has a lot of pieces. I could downsize with this. @Sarah - this would work great WITH the Superfort, too! Yes, these three are the same, just different colors - it can be used in so many different configurations! To enlarge a picture, click on it to make it the main image and then click on the main image to enlarge it. Awesome. Just ordered this for my daughter's birthday. Hope it arrives in time. @Sarah - she is going to love it! Lucky girl, awesome Mom!! This looks like a great Grommet! 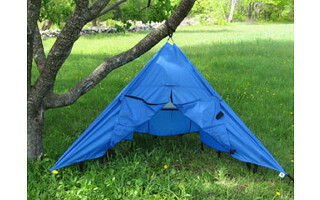 The concept is interesting, but the price is unrealistic for a modified nylon tarp. When the price come down, I'll consider a purchase. @anonymous - it is a bit of a Catch-22. To support innovation we often feature products that aren't in mass production. As a society, we have become accustomed to the prices of goods that are mass-produced with lower quality materials and cheaper labor prices such that our sense of what a product should cost is affected. This discount culture may negatively affect our country's ability to innovate. On occasion, when your budget allows, we encourage you to support products of smaller companies that you think did a good job of bringing a product with value to the market. Your vote with your dollars will help encourage the innovation that we believe is vital to our country. If you currently use a product that you love, that you find to have real value to you, and that comes from a responsible company we would love to here about it and possibly feature it as a Grommet! Click on the 'Tell Us' button at the top. Can you tell when either the blue or lime Fortamajig will be available again? I am interested in purchasing one. I think it makes a great gift. My kids were always making forts! @julie: Right now they are expecting them by mid-December, but unfortunately any unforeseen delay could cause this date to be missed and therefore not available for holiday delivery. I don.t think this is original. It is available on a lot of survival/ camping/backpacking web sites. My son has been camping for over a year with his. The only difference is the size. My son's is for a grownup and this one is for kids. Don't get me wrong, it is a good idea, just not original. I am about to order for my great-nephew but I need to ask exactly what it is made from so I can consider toxicity and where it is made. @ Coleen: What a treat for your great-nephew. The fabric is 100% polyester. You can read more info in the DETAILS tab (under the video) of the page where the Fortamajig is featured. Katherine of Fortamajig has this share: "Our products are manufactured in China, and are completely safety tested and required to adhere to all US safety standards." That was a quick decision...not buying it. Great idea but something else made in China! My granddaughter will just go without! Good for you, MaryT. I made my forts out of sheets and home-made quilts and had a blast doing it. What kid doesn’t love making a fort with blankets and chairs? And what parent doesn’t cringe a little when the kids grab your best clean sheets to make their fortress? With the Fortamajig, kids can exercise their architectural creativity and keep your special linens out of the game.